The annual SEMA Show in Las Vegas is really the place to be at, if you want to see the latest trends and builds in the automotive aftermarket. It's also the place many folks want their latest products and builds to be seen by all the decision-makers in the industry. For some, the opportunity is once-in-a-lifetime and for those folks and many others, the pressure is on, to make sure they make the most of that experience. After all, the ripples of publicity that come out of that single show can carry on indefinitely, especially with the way the show is now being captured with photos and videos thousands of times over and shared all over the world. Even with all those limitless possibilities for exposure, we still see countless cars and trucks every year, that get lost in the ocean of amazing machines that is the SEMA Show. Not all locations at the SEMA Show are equal, as some are very high traffic, while others are harder to find, which is often reflected in the cost of getting into one of the more-coveted spots. The OPTIMA booth #22755 in the heart of Hot Rod Alley in Central Hall is probably one of the higher-visibility locations at the show, as we're positioned in between the Ford and Chevrolet displays and parked right next to some high-profile neighbors, including Holley Performance Products and The Enthusiast Network, which has an audience of almost 150 million through it's various titles, including Hot Rod, Car Craft, Four Wheeler and Roadkill TV. Outside, OPTIMA Alley welcomes everyone entering the show from the bus drop-off and registration at the North end of the Las Vegas Convention Center. While conventional (no pun intended) wisdom might suggest an indoor spot is the place to be, that's not always the case. We've seen groups of cars buried in the back corners of buildings before, with little traffic going by throughout the week. We've also spotted cars located in very high-traffic areas, that totally miss out on opportunities, because the car happens to be black and is positioned in a darker area of a hallway, that makes it incredibly difficult for 90% of those in attendance to get any decent photos. There are also literally hundreds of cars and trucks in feature vehicle locations each year, that miss out on countless opportunities, because they don't offer any way for someone interested in learning more about the build to contact the owner or builder. We know this first-hand, because we've struggled to track down car owners and builders every year since the OPTIMA Ultimate Street Car Invitational began in 2008. We'll give you three different examples to illustrate our point. 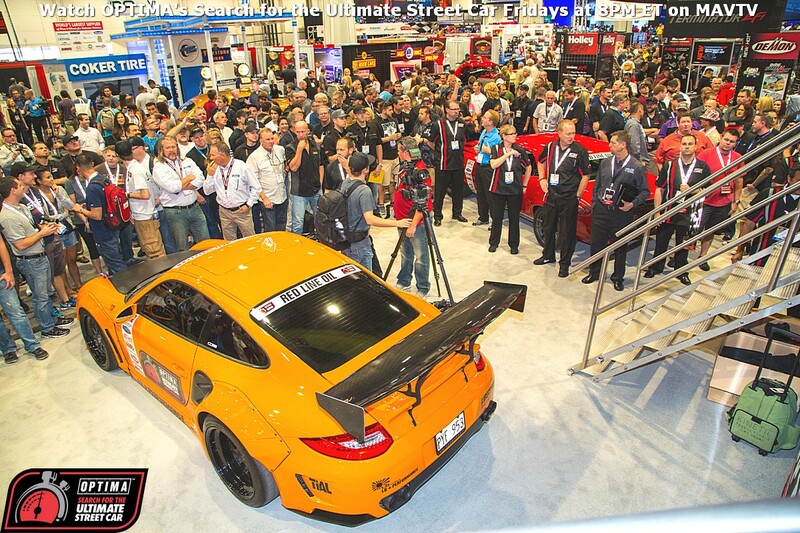 The first is the BBI Autosport Porsche 997 that appeared in our booth at the 2014 SEMA Show. If someone just saw a photo of the car and wanted to learn more, the OUSCI decals might give them all the clues they need to dig deeper and find out all about how it debuted the first Liberty Walk widebody kit on that model and competed in the 2014 OUSCI. Even if someone went no further than to google "orange 997 SEMA" it would be impossible not to find a multitude of results that go into great detail about the car. Then we go to Joe Escobar's orange 1974 Ford Pinto, which was also on display at the 2014 SEMA Show in OPTIMA Alley, before competing at the 2014 OUSCI. If someone only saw a photo of Joe's car in OPTIMA Alley and googled "orange Pinto SEMA," you're going to see Joe's car in the results. That's great for the handful of 997s and Pintos that might ever show up at SEMA, but what if you're looking at a photo of a particularly popular model of car or truck, like the Ford Mustang? That's where you really have to put your work in to get noticed, especially after the show ends. We first spotted this orange 1965 Ford Mustang Fastback in the Green lot before the SEMA Show started, when it pulled into line for a free OPTIMA battery. We ended up spotting the car again later at the show, in the same place Scottie D spotted it when he filmed this video, but as we looked at the car and later watched the video, we learned almost nothing about the car, the owner or the builder- missed opportunity. Shadows always seem to cover at least part of the car whenever we saw it, making it nearly impossible to get another clean photo of the spectacular paint job. We don't know if the owner cared one way or the other if anyone knew who they were (some don't), but between the builder and the companies that supplied parts for the car, we're pretty sure at least someone would've liked to have more information readily-available for interested parties. We're not big fans of QR codes, but we have noticed more than a few cars displaying an Instagram or Twitter handle in a small decal, which is a great way to get instant recognition, build an audience in social media and share more information about you and your ride. However, in the case of the Mustang, there was no such identification and running the same google search for "orange Mustang SEMA" would make someone search for a long time before they'd see any additional information specific to this car. Had this car run in qualifying events for OPTIMA's Search for the Ultimate Street Car Invitational and received a SEMA invite via that opportunity, there would've undoubtedly been far more exposure for the car. The opportunity to run in a qualifying event for OPTIMA's Ultimate Street Car Invitational won't work for every SEMA-bound vehicle, but it obviously could've been a great fit for this Mustang, even if it didn't end up qualifying for the event. If you've been wanting to get into the SEMA Show, take a look at OPTIMA's Search for the Ultimate Street Car Series and the opportunities it offers to get on national TV, get great exposure for sponsors and possibly make it to SEMA and beyond!